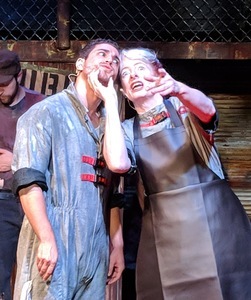 If you want to enjoy an evening of outstanding theater, I’d suggest you get tickets in advance for Ridgefield Theater Barn’s production of Urinetown the Musical before they completely sell out! 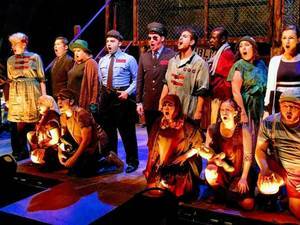 Winner of the 2002 Tony Awards for Best Musical and Best Original Score, Urinetown, the Musical, has Music & Lyrics by Mark Hollmann with Book & Lyrics by Greg Kotis. The unique musical is a satire set in a dystopian world where a terrible water shortage, caused by a 20-year drought, has led to a government-enforced ban on private toilets. This irreverent, satirical musical comedy pokes fun at politics, capitalism, corporations, and more. It evens takes jabs at the genre of musical comedy where you’ll see homages to Les Misérables, West Side Story, and Fiddler on the Roof. Michael Valinoti portrays the narrator Officer Lockstock as he breaks the fourth wall to explain the intricacies of the plot with the help of the impressive talent of Monica Harrington as Little Sally. Her ability to switch from sweet and innocent to sharp and sassy in a heartbeat was perfectly placed in “Tell Her I Love Her.” Elyse Jasensky tackled the tough songs of the intimidating Pennywise with vigor. Chris Balestriere as Bobby Strong and Meaghan Elliot as Hope Cladwell develop their love story against incredible odds and humorous situations. Hope’s father, Caldwell B. Cladwell is played by Duane Lanham and embodies a slimy corporate exec to perfection. Joe Caputo has some hysterical, scene-stealing, comic bits as Officer Barrel. In act two get ready to be blown away by “Snuff That Girl” sung by Stephen Emerick as Hot Blades Harry and Samantha Holomakoff as Little Becky Two Shoes as well as Bobby’s “Run, Freedom, Run!” Backing up these amazing lead vocals is a remarkable ensemble. 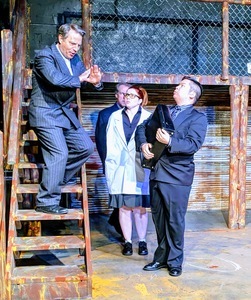 Rounding out the cast is James Hobayan as Mr. McQueen, Bill Warncke as Senator Fipp/Old Man Strong, Shawn Tyler Allen as Tiny Tom, Rachel Lotstein as Soup Sue, Rachel Lewis as Robby the Stockfish/Dr. Billeaux, Lesli Allen as Josephine Strong and Harry Brendan Garnett as Billy Boy Bill. The ensemble worked seamlessly together. Every actor is engaged, whether they are acting or reacting. The production is filled with crisp choreography, tight harmonies and mischievous interplay. The intimate stage houses a 2-tiered set designed by Pamme Jones and Cathy Malloy and a fantastic 5-piece orchestra with Musical Direction by Lisa Riggs Hobbs. This production “wowed” the audience. We can attribute the insanely precise blocking, striking comedic timing, and not-so-subtle innuendo to the astonishing director and choreographer, Debra Lee Failla. I had the honor of being directed by Deb over 25 years ago. She is able to pull the best out of each actor and meld them together to create a unified cast. Ms. Failla is one the most dedicated, insightful, generous, and incredibly talented directors in our area. We hope she drifts up here to direct more often! The fun isn’t just for the stage. At intermission, a UGC (Urine Good Company) representative is at the ready to take your fee at the unisex bathrooms. You can give an IOU but any proceeds collected will go towards the RTB’s sound system fundraiser. In the mood for an adult beverage, you can get yourself a “Tinkle Tonic” served in a specimen cup. Yes, I had a very difficult time drinking it until I poured it into a regular glass. Sponsored by J. Mulvaney Plumbing and Young’s Fencing, performances will continue Friday and Saturday evenings through September 28th, with Sunday matinees September 16th & 23rd at 5pm, and a special Thursday performance September 27th at 8pm. At the writing of this article, September 15, 21 and 22 are already sold out.